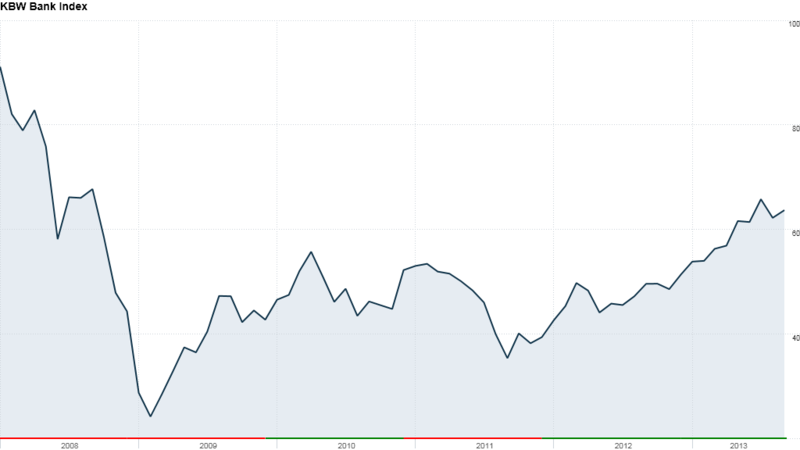 The KBW Bank Index, which tracks 24 major U.S. banks, has rallied 260% since the market bottomed in March 2009. Bank stocks were battered in the wake of the Lehman Brothers collapse five years ago, but investors have since embraced many of Wall Street's Too Big to Fail club. JPMorgan Chase (JPM), Goldman Sachs (GS) and Wells Fargo (WFC) have staged impressive comebacks, with shares trading at levels higher than they were before the financial crisis, while Morgan Stanle (MS)y is nearing breakeven. Citigroup (C) and Bank of America (BAC) shares are still about 50% below where they were just before financial markets were sent into tailspin, but they've each quadrupled from the March 2009 market lows. And experts are optimistic that the bank stock rally will continue as the economy recovers. The financial industry has come a long way and is much better off than it was five years ago, said Dave Ellison, who runs the Hennessy Large-cap Financial Fund (HLFNX) and the Hennessy Small-cap Financial Fund (HSFNX). "The mindset on Wall Street is much better today," he said. "Back then, we had a lot of bad thinking. Home prices will never go down. Interest rates will never go up." But thanks to regulations and standards put in place since the crisis, banks have refocused. They are much healthier than they were in 2007, with bigger capital cushions and cleaner balance sheets. Credit quality and loan demand have also shown marked improvement. While the near-failure of the banking system is to blame for the painful economic recession, the sector's recovery has been key to get things moving again. "Once the banks started lending again, that's when you started to see stronger auto sales and home sales," said Ellison. "The banking system is now laying the foundation for what will be a reasonably good economy for the next decade." He added that with the Federal Reserve's annual stress tests and more oversight over the financial system, banks should remain stable. 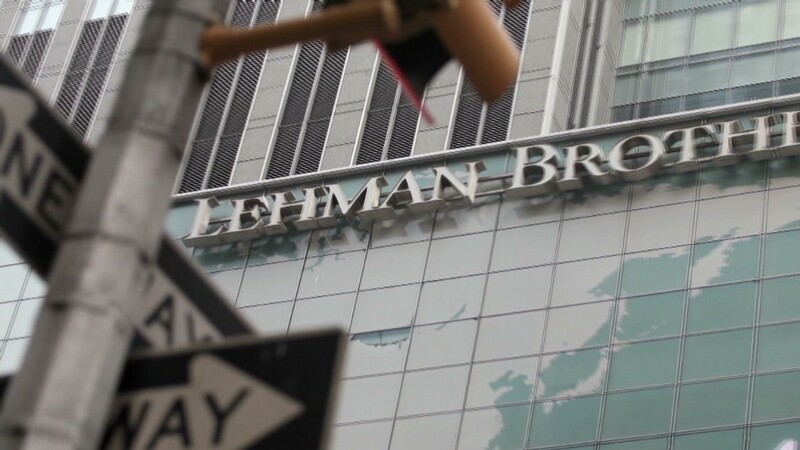 Related: 5 years after Lehman: Where are key players now? Of course, there are still lingering problems. Recent blow-ups like the London Whale trading loss at JPMorgan Chase show that the industry is still a risky one. "Banks were acting like hedge funds, and they're moving toward the role of being more traditional bankers," said Ellison, adding that the transition is ongoing. But while banks have grown since the financial crisis, their portfolios are smaller and the derivatives trading is more transparent. This comes at a price, however. The big banks are less profitable today than five years ago. For example, Bank of America's return on equity, a closely watched metric that measures how well banks generate profits for shareholders, stood at 5% last year, down from 11% in 2007 and nearly 20% in 2006, according to Thomson Baseline. But Ellison said there's still a lot banks can do to restructure and cut costs to improve profitability. What about higher interest rates? While a pickup in long-term bond yields may hurt demand for housing, experts note that bank profit margins could actually increase since higher rates will increase the spread between what banks pay for deposits and what they earn from lending. Ellison owns all the major banks in his funds, but he notes that Citigroup's valuation is more attractive than other big financial firms. He is also a fan of regional banks, particularly SunTrust Banks (STI). He says that Atlanta-based bank, which has thousands of branches across the Southeast, has the potential to grow rapidly. He also likes insurance giants Metlife (MET) and AIG (AIG). The latter, a favorite pick among hedge funds, and has also rebounded sharply since the worst of the 2008 crisis. AIG was one of the biggest recipients of bailout funds after bets on credit default swaps brought the insurance giant to near ruin. The stock is up 650% from its March 2009 lows, though its remains 50% below pre-Lehman levels.